The grounds of Boomeria are full of surprises, including a castle, catacombs, and a wonderful pipe organ inside the Chapel Royal. Created and maintained by "The Boom", a long-time local high school chemistry and physics teacher, Boomeria is a well-kept local secret. The Boomeria Organ itself was a project begun in 1953. In that year Trinity Paris Church (now Cathedral) in San José replaced its vintage 1879 organ console, which originally had been donated to the church by The Boom's great grandmother. Boomer rescued the console along with two sets of pipes. 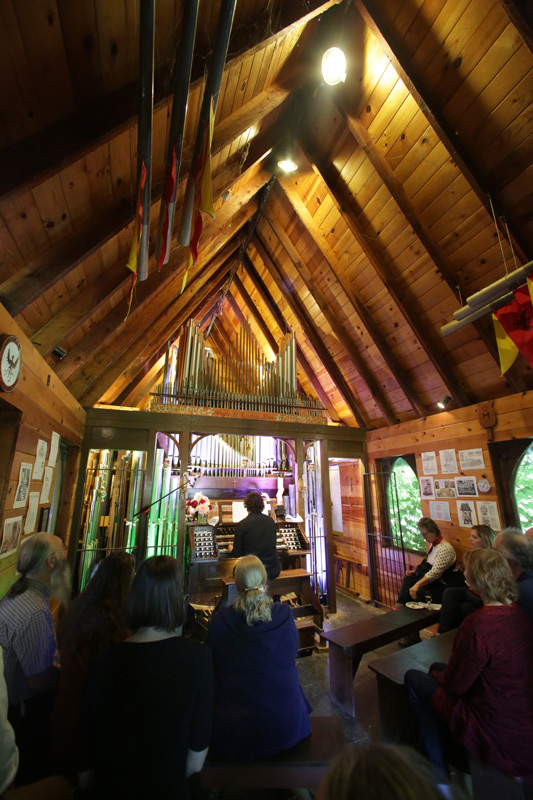 Generations of Boomer's San Lorenzo High School students helped with the building of this massive instrument and its intricate mechanisms, along with assistance from organ builders Bill Reid, John West, and Bill Visscher. The Boomeria organ now features 40 ranks, 2500 pipes, baroque voicing, and mechanical action. 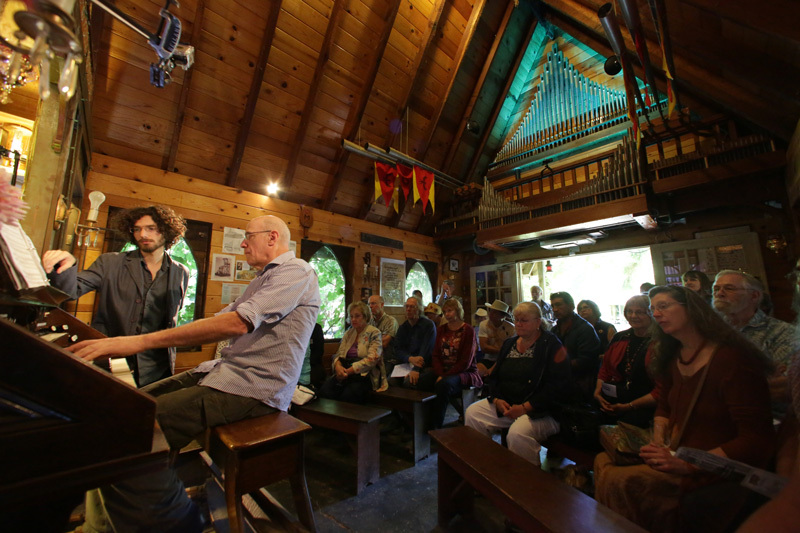 Listen to hours of music performed in the beautiful surroundings of the Bonny Doon forest. Local organists bring to life the repertoire and spirit of this magnificent instrument. As an added treat, guests are invited to crawl through the organ's insides and view a guillotine demonstration! The program includes performances by organists William Visscher, Nicola Saraceni Canzano, Ann Thiermann, and Vlada Moran. Also featured will be violinist Laura Gaskell playing selections from Heinrich Biber's Biblical Sonatas, accompanied on the organ by Martin Gaskell, and an 8 part Kyrie by Andrea Gabrieli performed on organ and crumhorns. Refreshment breaks will be accompanied by a viol consort playing Renaissance music and Lawrence Manzo playing traditional clawhammer banjo with guitar accompaniment. Bill Visscher will also give a lecture and demonstration on how organs work and take questions from the audience. Enjoy local and organic snacks with vegan and gluten-free options, along with an assortment of soft drinks and Hallcrest Vineyards wine. Proceeds from this fundraising event benefit the continued operation of the Baroque Festival's annual concert season. Watch some fun Boomeria videos!